Strong adjustable height tables are the basic building blocks for the mail center, mail room, warehouse and office. Finding the right adjustable height table is key; look for quality tables that will hold up to the day to day operation of a busy mail center or office, our tables offer this - durable, well constructed mail room tables that are made to last, they feature best quality table tops and adjustable height legs which keeps bending and reaching to a minimum. Features extra deep open storage area for keeping supplies close at hand. Lower shelf can be re-positioned in the middle of the cabinet. 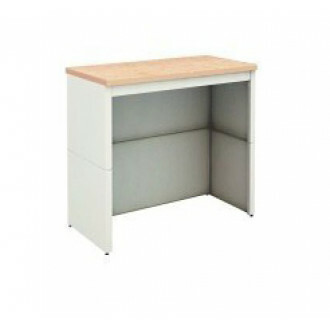 To view our entire table/cabinet product line - click here. To view optional table accessories - click here. • Available with 3 different table top colors: Oak, Walnut and Grey. • Steel mail room table base is finished in durable Putty or Grey enamel finish to resist chipping. • The table top height adjusts from 33" to 40" in one inch increments for sitting or standing. • Table tops are 1-1/8" thick high pressure melamine board with double backing. • Plastic table top edge guard eliminates chipping. • Flat table top edge allows tables to be butted up to each other with no gaps. • Front table support rail is 13 gauge steel and formed for maximum strength. • Side panels are 18 gauge steel with welded corners and leg adjustment tubes for extra rigidity. • Chrome legs are 1-1/4" square steel tubing with heavy duty leg levers for a level working surface. • All steel construction adjustable mail room table base is formed and welded for the strongest table you will ever need. Color: Oak table top with putty table base, Walnut table top with putty table base, Grey table top with grey table base. Please specify color when ordering. Have questions or need help? Contact our sales department. We can help you find a Product or Design a Custom Product for you. Complete the form below or call us at 800-328-2962. Sign up to see our New Products and Installations.